When it comes to breakfast food in America, there’s a veritable Mount Rushmore of chains to pick from: McDonald’s. Waffle House. Dunkin’ Donuts. But it’s perhaps the fourth and final breakfast luminary, IHOP, that has etched what it means to dine out in the morning into our collective psyches. 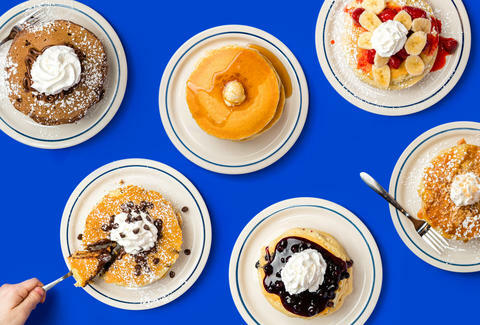 The chain, which was born in Southern California in the 1950s, has embedded its iconic blue-hued roofs from coast to coast and, more recently, across the globe, feeding its customers everything from French toast to burgers. Flavor: We judged each pancake variation based off how well each of the assembled elements on a particular stack taste once they hit your tongue. Ingredient interplay: This takes the analysis of flavor one step further by considering how well each element included within or on the stack plays off one another. Is there too much going on? Is there not enough going on? 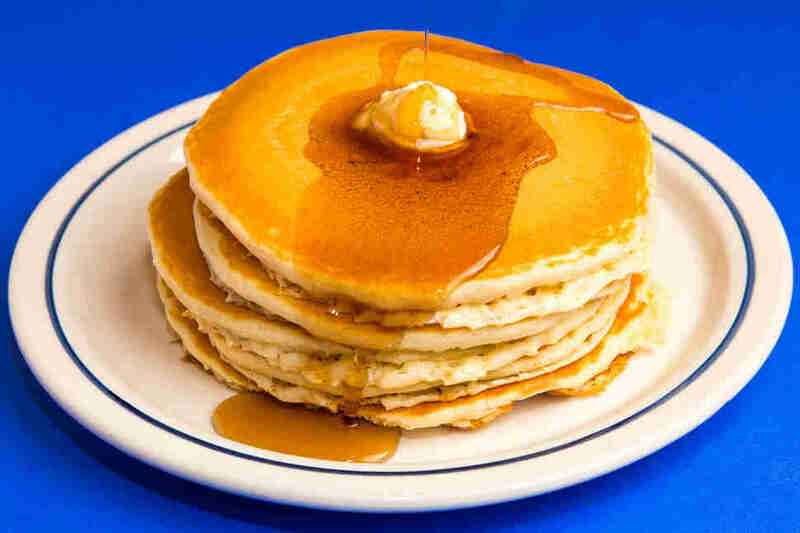 Syrup-icity: This criterion measures how well a particular stack performs without the help of syrup. 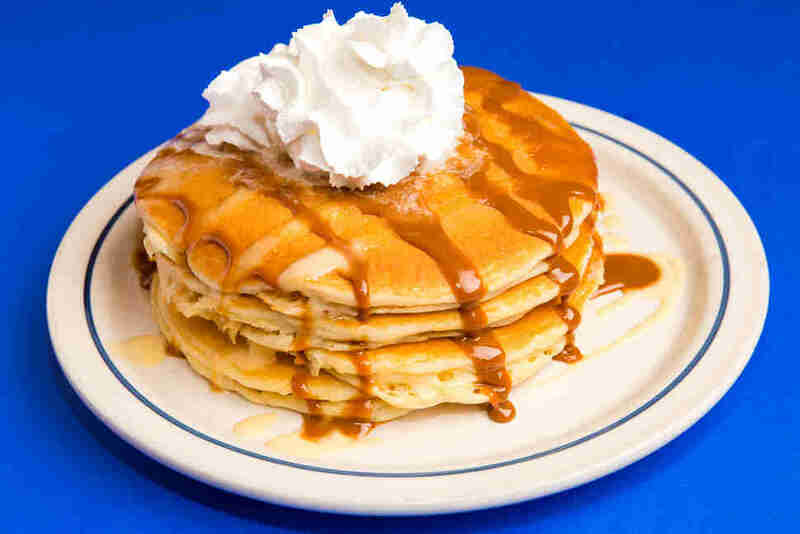 Some special stacks have built-in syrup-like elements that allow you to eschew the condiment; others need some type of syrup to prevent cottonmouth. 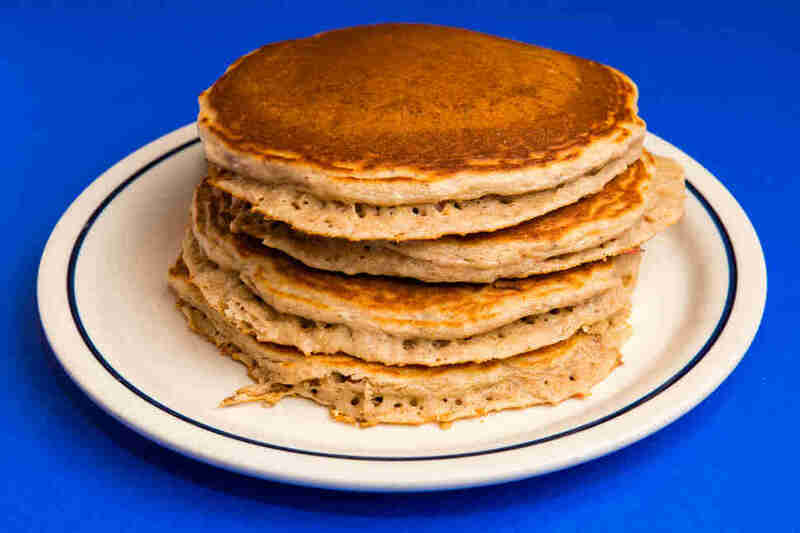 IHOP’s menu describes its Harvest Grain ‘N Nut pancakes as “a stack of four pancakes made with hearty grains, wholesome oats, almonds, and English walnuts,” which more or less means these hotcakes qualify as the chain’s "healthy" option (a stack of four clocks in at 990 calories). We commend the company for even trying to spin the carb-heavy breakfast favorite as a nutritious choice, but let’s be real: Pancakes are best served with a side of gluttony, and these flapjacks arrive without it. 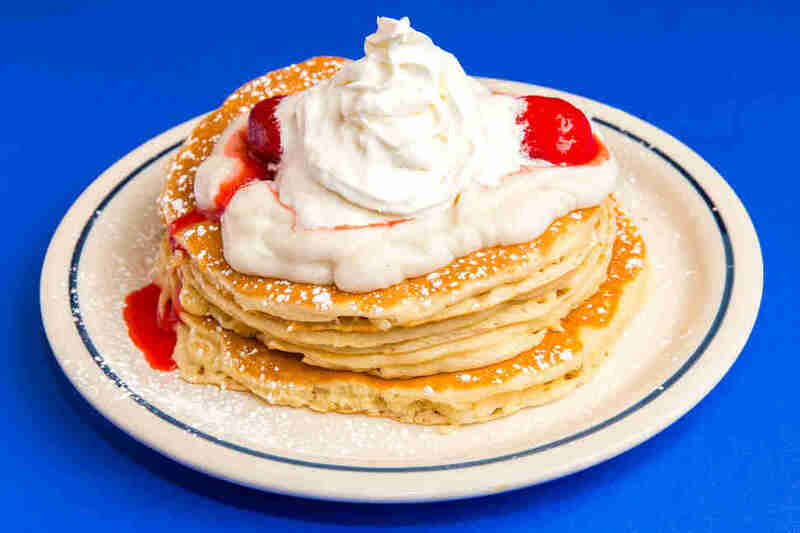 The idea behind the Mexican Tres Leches pancakes on IHOP’s International Menu is better in theory than in practice. The buzzwords for a deliciously sweet stack are all there, but unfortunately, all one tastes when cutting into these are the whipped cream topping and the buttermilk hotcakes below. The advertised vanilla sauce and dulce de leche sauce are disappointingly absent. And as well all know, life could always use more dulce de leche. 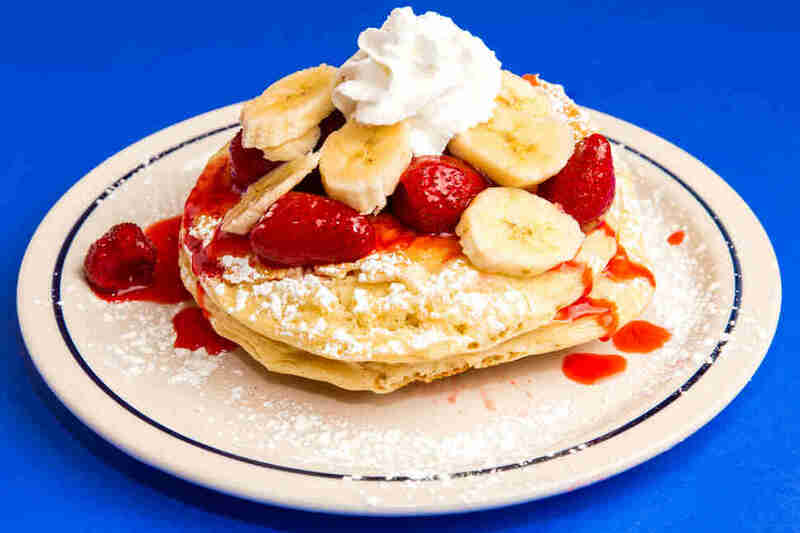 Similar to the aforementioned peach-topped pancakes, the strawberry banana option is a no-frills fruit-covered standby that works by pairing a classic flavor combination. The bananas are ripe and freshly cut and obviously team well with the whole, glazed strawberries on the top of the stack. Again, however, it scores low on the Syrup-icity scale, and its lacking the in-your-face flavor that you’d expect from receiving both items as condiments. If you’re throwing caution to the wind and going full-dessert for breakfast, the New York cheesecake pancakes are extremely for you. This stack is perhaps the most obviously sweet on the menu, as the chain portions out a good amount of cheesecake pieces into each square centimeter of pancake. The pieces are soft, doughy, and melt-in-your-mouth buttery, and let customers get their requisite cheesecake hits without getting too full after a few bites. 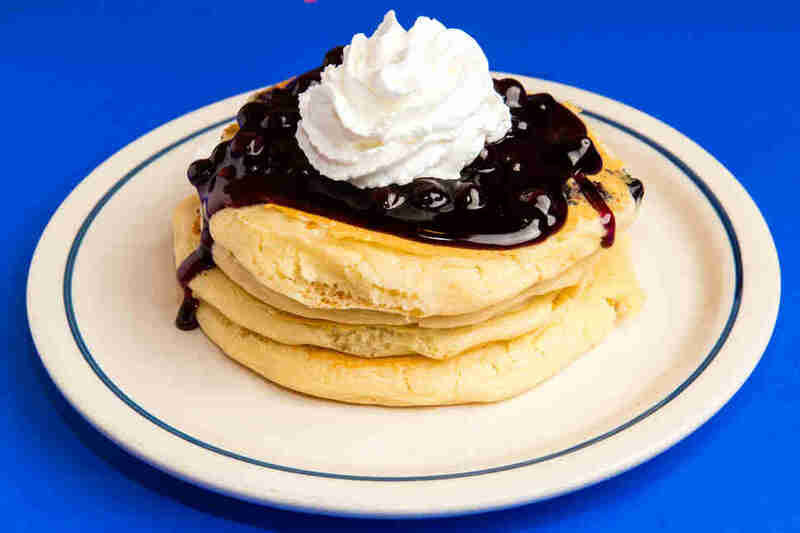 Sweets lovers will salute the hell out of IHOP for this move, but customers with tamer or more savory-inclined palates should steer far away from this sugar-busting stack. 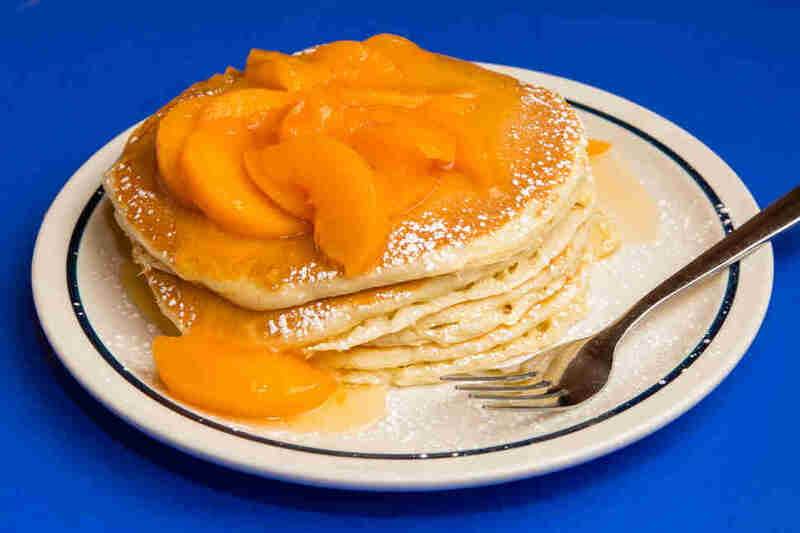 Look, you’ll definitely need syrup to down arguably America’s most beloved flapjacks, but everything else about these plain pancakes sets the bar for chain-restaurant hot cakes. You can taste the buttermilk in every bite, and the sweet-but-not-too-sweet batter allows each pancake to pair well with everything from cupcake sprinkles to eggs and bacon. And structurally, few pancakes beat IHOP buttermilk pancakes’ build: The exoskeleton is sturdy enough to protect the fluffy, airy innards, making for a pillowy beauty you’ll want to rest your head upon. Or eat. Unlike the New York cheesecake pancakes, the cupcake pancakes strike a better balance between breakfast item and dessert treat. 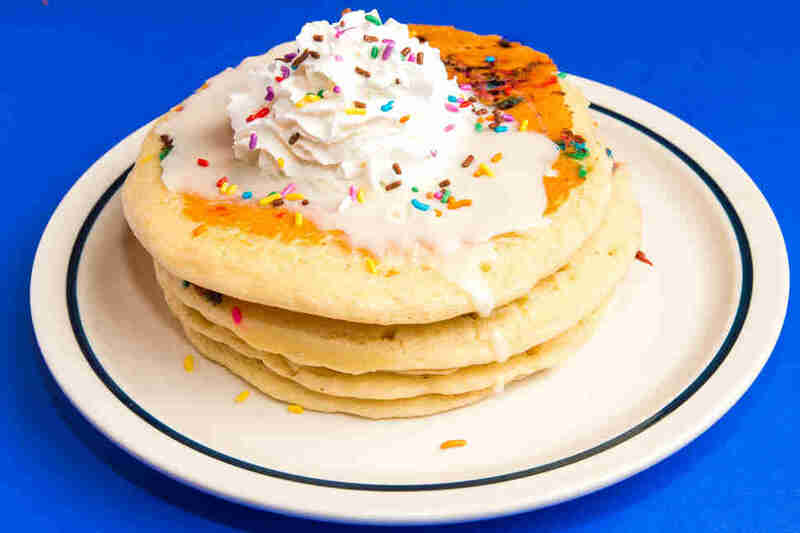 The buttermilk pancakes make a perfect partner for the rainbow sprinkles, icing, and whipped cream. What this stack could use, however, is a bit more icing. They require more syrup than expected to offset the dryness of the sprinkles. Otherwise, dessert obsessives and non-obsessives will agree that these flapjacks are a proper solution for an impromptu sweets craving. 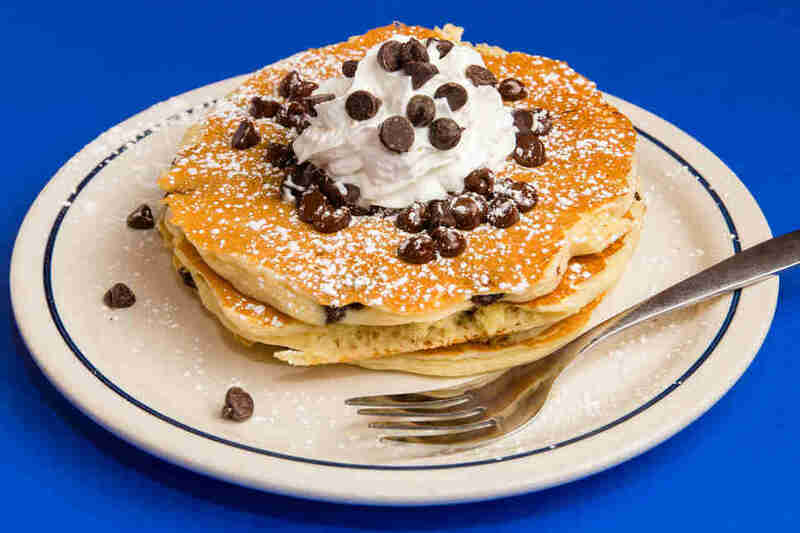 Compared to another chocolate-based stack, the Belgian dark chocolate pancakes, the chocolate chip flapjacks are the bigger flavor bomb; getting through this stack won’t require syrup but rather a whole glass of milk. The chocolate is intense but not too intense, which will prove divisive with certain customers. However, it does the whole chocolate-chip pancake thing well, just prep yourself for a food coma and sugar crash after you’re done eating. The chocolate flavor in this stack is more subtle than in the chocolate chip pancakes, but will probably appeal to chocolate obsessives more, as the four chocolate layers (the chocolate pancakes, the dark chocolate mousse, the chocolate chips, and the cocoa powder) all play off one another. This stack doesn’t lack for a syrup-like element, as its cocoa-powered ingredients ensure that no additional condiment is necessary. This is pure sweets-based breakfast bliss. 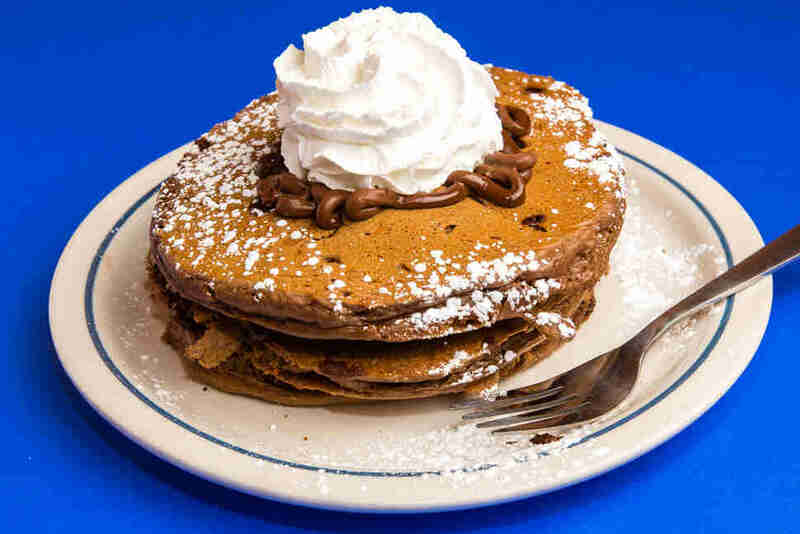 Depending upon which IHOP location you’re visiting, the beloved Cinn-A-Stacks may or may not be on the menu. They were a formerly limited-edition item that have been brought back permanently in some stores after a national outcry at their removal from the menu, but even if they’re not listed, customers can still ask for them, and servers will know what to do. So is the item worth the hype? Definitely, as it rates highly in all three categories, and, like the cupcake pancakes, will appeal to anyone who appreciates sweet carbs. The cinnamon is up front and present in every bite, and the cream-cheese frosting negates any need for syrup. Hell, the Cinn-A-Stacks are good enough you’ll consider wanting all of your future cinnamon rolls in pancake form. The Strawberry’N Cream pancakes succeed exactly like their blueberry brethren, but enjoy an additional element to rank them one slot higher: the vanilla bean mousse. 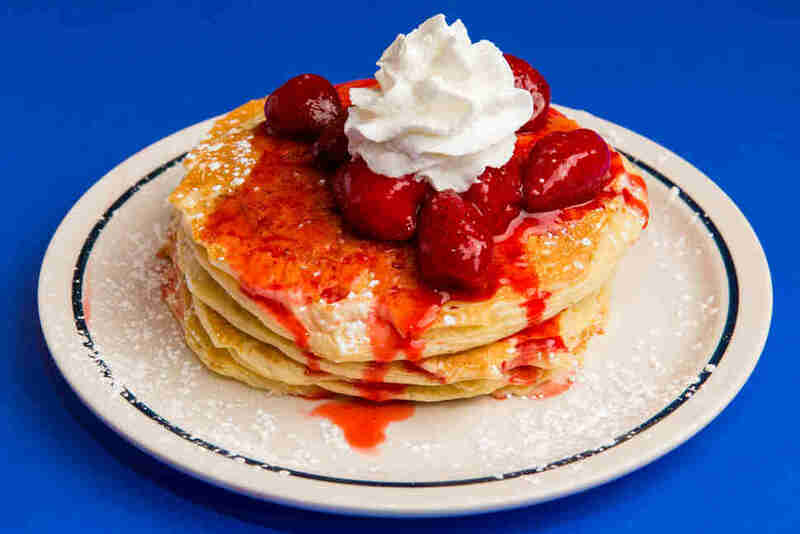 The creamy mousse provides a nice layer of creaminess while eating your way through the stack's glazed strawberries, pancakes, whipped cream, and syrup. Remember how pancakes should be gluttonous? 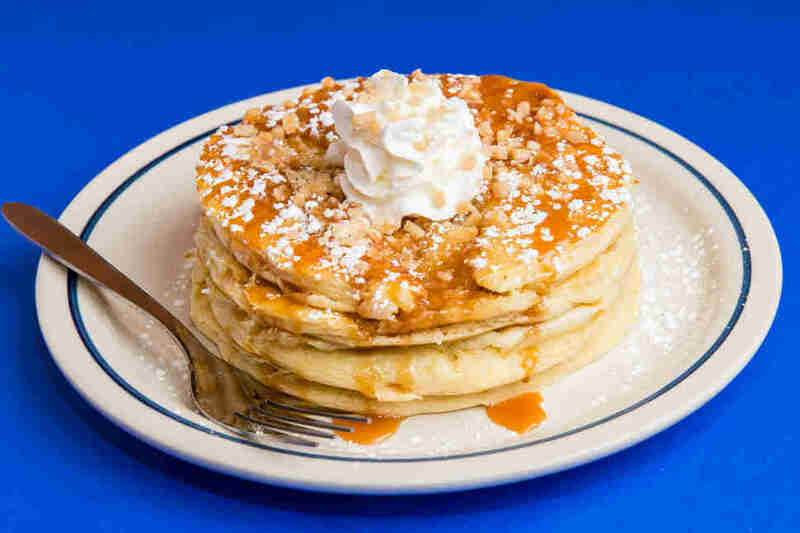 Well let IHOP’s English sticky toffee flapjacks stand as the archetype. This stack has everything from whipped cream and a salted caramel sauce to crunchy toffee bits and a luxurious salted toffee mousse. 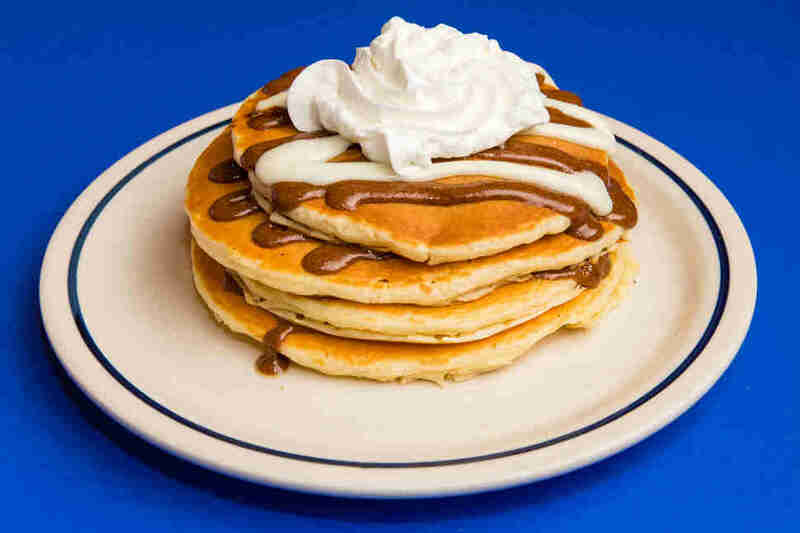 It really hits the spot, without being cloyingly sweet, and has a caramel sauce that should be bottled and left on every table for use on other IHOP items. It’s over-the-top and ridiculous, but also absolutely delicious, as pancakes should be. Ryan Joseph is a freelance writer and Ohio native who thinks your Cincinnati chili hot take is trash. Follow him @Ryan_M_Joseph.